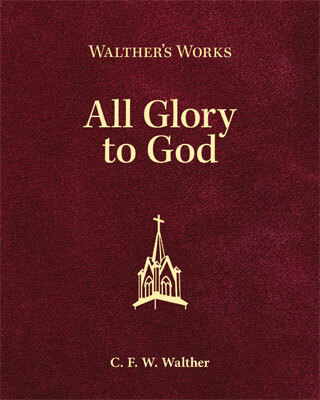 What Others Are Saying about "All Glory to God"
Read below what others are saying about the newest volume in the Walther's Works Series: All Glory to God. C. F. W. Walther deserves more credit than any other man for the restoration of orthodox Lutheran dogmatics, which by the grace of God took place in America during the nineteenth and twentieth centuries. Unlike his student Francis Pieper and his younger contemporary Adolf Hoenecke, Walther did not produce a dogmatics textbook since he worked from the Walther-Baier compendium of quotations from the dogmaticians of the seventeenth century. Students of Lutheran dogmatics, therefore, will welcome this collection as the closest thing we have to a summary of Walther’s complete dogmatics. Battling a fever and only months before his death, C. F. W. Walther concludes his straight-forward defense of the major doctrines of the true Christian Church, consistently using the question, “Does this teaching give all glory to God alone?” as a sure and certain litmus test for theological truthfulness. In this final apologetic, Walther makes the case for a conservative, confessional Lutheran approach to the major doctrines of Scripture. In deliberative and comprehensive fashion, he calls to the witness stand the testimony of his opponents, contrasting them with the clear words of the prophets and apostles, the Lutheran Confessions, Luther, and the Lutheran Church Fathers. This presentation to the Western District over the course of eleven conventions (1873–1886), is C. F. W. Walther’s Smalcald Articles; it is a final legacy—a theological last will and testament—to his beloved church family. This volume is key to understanding the turbulent historical and religious context in which the first president of The Lutheran Church—Missouri Synod presents the unchanging Word revealed by the Lord through Luther and the Reformation. The essays in this book are a virtual dogmatics that include most of the essential doctrines of the Scripture. It is the dogmatics book that many desired C. F. W. Walther to write, but which he never was able to complete. Walther demonstrates that only teachings that give all glory to God are scriptural. Only in the teachings of the Lutheran Church is God alone given all glory, and this is incontrovertible proof that its teaching is the only true one. The doctrines and applications presented, such as that of election, justification, Means of Grace, civil government, and family, are vital for the church today. Here the same question is continually asked about the discussion of doctrines and their practical applications: Does the treatment found here give all glory to God, as all theology should? It is a useful criterion for avoiding self-serving wrangling and finding reassurance. The over-arching claim throughout the series of essays is that this approach is a proof that the Lutheran Church’s teaching is the true doctrine. But the intent here is not to make the judgments of human reason the touchstone for distinguishing true doctrine from false. For the essays, from the outset, trace the approach of giving God the glory in all teaching to Scripture itself (Isaiah 42:8, etc. ), so that it is proper for Christians to be so guided. This new English edition of C. F. W. Walther’s dogmatics essays makes it easy to find what he believed and taught about classical Lutheran theology. These essays cover all the major topics of Lutheran theology, with a mind to Luther’s statement: “The doctrine of the Gospel takes away all glory, wisdom, righteousness, etc., from men and gives it solely to the Creator” (AE 26:66). Walther proves that only Lutheran theology gives God due honor by accepting what God says in Scripture as the truth, whether or not it makes sense to human reason or reason’s notions of goodness and righteousness.